The teapot is undoubtedly the most important tool you need to enjoy your tea. Thanks to its spacious filter, the whole tea leaves can develop during brewing and release all their aromas. The instructions are clear and it is easy to use: simply place your desired amount of loose tea leaves in the filter, pour in boiling water and leave to brew for as long as you like. Push down the plunger and your tea is ready! This very elegant glass teapot with a stainless steel infuser (900ml capacity) from Judge is compatible with all heat sources including induction hobs. Fall in love with this 1.25L Chinese cast iron teapot in Akita cream and enjoy a traditional tea experience! Free delivery! Free gift! 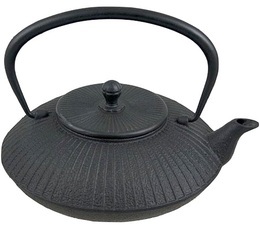 Discover this pretty Myoko black Chinese cast iron teapot with a 1.2L capacity. Inspired by the Japanese tradition. Its removable stainless steel infuser is easy to clean. A Bodum Assam box including a 1L tea press with a stainless steel infuser and 2 x 0.35L glass mugs. Discover the VIVA Scandinavia glass teapot with a 1 litre capacity, a stainless steel tea infuser and silicon lid. Discover this QDO set from the 'Element Feu' range with its modern and ingenious design. 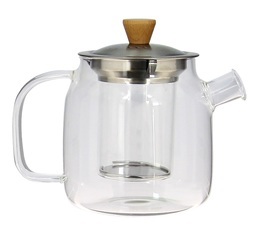 Contains a 500ml double wall glass teapot with tea filter and 2x21cl cups. Enjoy a tea for two! Fall in love with this superb blue cast iron teapot (enameled inside and out) by Ogo Living. 90cl capacity to make around 8 cups of tea. Prepare your tea directly in the teapot using its stainless steel infuser. Tea 4 U" teapot by QDO with an infuser and a black handle. 1 litre capacity. With two 21cl double wall Earth design glasses. The Bodum 1.5L Assam tea press with a stainless steel filter is the most pleasant way to enjoy a tasty cup of tea with friends. French press system. Discover the Cortica teapot from VIVA Scandinavia, made of glass and cork. 500ml capacity. Supplied with a stainless steel tea ball infuser. Discover the Bodum 50cl Assam tea press. The most pleasant way to enjoy a tasty cup of tea with friends. Discover the Chambord Total Colour White teapot by Bodum. 1 litre capacity. Made from glass, plastic and stainless steel. Tea leaves can be infused freely. Discover the 1.3L copper stainless steel Chambord teapot from Bodum. Its infuser allows your loose leaf tea to develop great aromas.